Fast growth in developing economies drives up global energy demand a third higher. The global energy mix is the most diverse the world has ever seen by 2040, with oil, gas, coal and non-fossil fuels each contributing around 25%. Renewables are by far the fastest-growing fuel source, increasing five-fold and providing around 14% of primary energy. Demand for oil grows over much of Outlook period before plateauing in the later years. Natural gas demand grows strongly and overtakes coal as the second largest source of energy. Global coal consumption flatlines with Chinese coal consumption seeming increasingly likely to have plateaued. The number of electric cars grows to around 15% of the car parc, but because of the much higher intensity with which they are used, account for 30% of passenger vehicle kilometres. Carbon emissions continue to rise, signalling the need for a comprehensive set of actions to achieve a decisive break from the past. Under the ET scenario, fossil fuel consumption continues to rise steadily from 11354 Mtoe in 2016, to 13308 Mtoe in 2040, an increase of 17%. The biggest increases occur in Asia, mainly outside of China. Fossil fuel consumption in the US only falls slightly by 3%. And even in the EU, fossil fuels still account for 59% of primary energy in 2040. Emissions of CO2 continue to rise till around 2030, after which they level off under the ET scenario. The Evolving Transition scenario appears to be the most realistic one, and would reflect pledges made at Paris. This is an interesting one, and is defined as a worldwide ban on ICE car sales from 2040, along with regulations gradually increasing beforehand. BP assume this will result in BEVs accounting for a third of all car sales in 2030, and two thirds in 2035. Even though a few countries such as the UK and France are moving in this direction, a worldwide ban is surely pie in the sky. Yet, even if it happens, it actually makes very little difference to CO2 emissions. BP’s explanation is that fuel efficiency will continue to improve in the intervening years anyway. There is one other aspect to this though. BP assume that the electricity to power the additional EVs will come from renewable energy. However, in general, energy from wind and solar is usually maximised by the grid, as it would obviously be silly to throw it away. This is certainly true in the UK, the only exception being when wind farms are paid not to supply when it is too windy. In other words, any additional power needed, over and above what renewables can supply at any given time, would by definition have to come from dispatchable sources, principally fossil fuels. Under this scenario, EVs may save little or nothing in the way of CO2 emissions. The pace at which renewable energy penetrates the global power system depends partly on the size and persistence of government support. In the ET scenario, support for renewables is largely phased out by mid 2020s. We also consider an alternative scenario in which levels of government support per unit of capacity installed persists around current levels until 2040. So, the more renewables you have, the more reliable electricity you have to provide as back up. Now who would have thought that? It is interesting that high levels of subsidy are still needed until 2040 to achieve this higher level of renewable energy. We keep being told that wind and solar power will soon be competitive (well just over the rainbow it seems!). So why do they still need subsidising till 2040? Even then, emissions in 2040 are still barely below what they are now. 3) Faster and Even Faster! We’re really getting into Cloud Cuckoo Land here! BP assume, for instance, that the power sector is almost entirely decarbonised by 2040 under this scenario. To do this would need a sharp increase in carbon prices, which would then encourage greater use of CCS, as well as renewables. There would also need to be a “range of other policies”. I see no prospect that any country will be prepared to cripple its economy in such a way. Even the lemmings in the EU don’t seem that stupid. BP seem to be operating under a fundamental misunderstanding here. Even so, the projected rate of growth [in emissions] is far higher than the sharp decline thought necessary to be consistent with achieving the Paris climate goals. This highlights the need for a more decisive break from the past than implied by the ET scenario. As we know, although the worlds’ leaders preened themselves when they agreed to limit the increase in global average temperatures to “well below 2 °C above pre-industrial levels, the Paris Agreement never actually pledged to reduce emissions. On the contrary, the individual INDCs, according to the UNFCCC themselves, would result in emissions rising by 12% by 2030. When faced with the suicidal cost of meeting supposed climate goals, the world backed away and decided that economic growth and standards of living mattered far more. Why any government should depart from such highly desirable goals, and instead sail away into La La Land is beyond me. ← New Battery Storage Launched In Wales–But Who Pays For It? More non science fiction. The only scenario that is going to turn back the clock on fossil fuel use is lack of availability and that’s centuries away if we stop exploration today. Fact is fossil fuel use growth is greater than renewable replacement. Like the Hollywood lady mis-stated regarding curling — this is boring. Oil, coal, gas and non-fossil fuels will each account for a quarter of the energy mix by 2040, leading to increased competition across fuels, says BP’s chief economist Spencer Dale. Yes the same Spencer Dale who could not see beyond the end of his nose when Chief Economist at the Bank of England can now see all the way to 2040 it is claimed. We get some perspective by the fact he went to BP as presumably he was not considered good enough for the OBR which is a terrifying thought if you think about it. When you see the words “carbon emissions”, you know you are reading propaganda. minus eighteen in Moscow at present and I suspect they are burning anything they can lay their hands on. I see that coal stations are producing 20% of our electric power this morning. Those are the same stations that the UK Government has ordered to be scrapped in the next few years. Also, 7% of our electric power is coming from the Continent – further security of supply there, then! Do any of your readers think that ‘Dreamer Dale’ has calculated the cost of rewiring millions of homes to cope with all the cars plugged into the mains supply,or where all the millions of clapped out batteries and solar panels will stored or buried in future.In view of his current and previous employment he has not run a business that involves using his own money!! The true crime in all this is that UK citizens are being denied access to cheap, reliable and secure energy while the rest of the world is free to access as much as they want/need. BP knows that renewable are a pipe dream but needs to be PC. It’s a question of waiting out the climate hysteria while opposing it. Like all fads it will end. I hope (and, in fact, believe) that you’re right there Stephen. Whilst BP might have made some dubious assumptions in their forecasts, on the whole they have broadly the correct conclusion. That is, even with all the vague INDC submissions to COP23 being fully implemented CO2 emissions will keep on rising until 2040, whilst the under the UN’s assumptions (which I do not agree with) preventing 2°C of warming requires global GHG emissions to fall rapidly, and to be at third lower than today in just 22 years time. In this context, I would like to highlight two problems with BP’s presentation, that they share with practically everyone else promoting climate mitigation. First, is that climate mitigation policy is (mostly) implemented at country level. 80% of the global population live in countries where emissions are likely to increase, even if the INDC submissions are fully implemented. China and India are highlighted because of their vast populations and very high emissions growth rates. But other SE Asian countries combined have a billion people and quite high emissions growth rates, whilst the 50+ nations in Africa also have a billion people, and are collectively likely to continue increasing their emissions for decades. The policy proposers are not exactly reaching out to these countries, to include them in the proposals. Second, as well as reducing demand for fossil fuels, policy must also recognize that global supply will also be reduced. For instance, hidden in the bp-energy-outlook-2018-data-pack.xlsx are projections for global production of fossil fuels. Russia, China, and the Middle East will continue to dominate supplies of coal, oil and gas. Yet to achieve the emission aims perhaps 75% of proven recoverable reserves must be left in the ground. 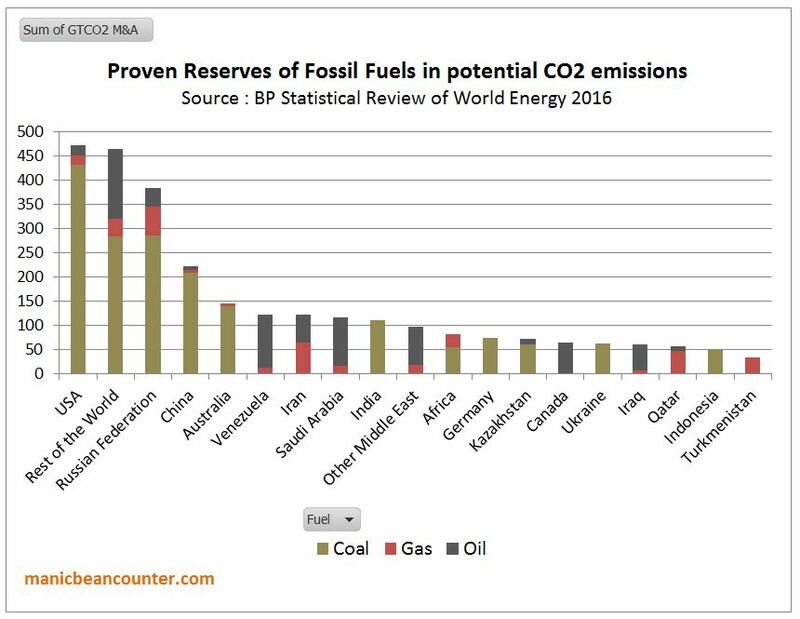 Further, total potentially actual fossil fuel resources are at least 3 times (and maybe well over 10 times) the currently recoverable resources. Last year, combining data from McGlade and Ekins 2015 (doi:10.1038/nature14016) and the BP Statistical Review of World Energy 2016. To achieve the 2°C of warming requires persuading many countries who are large net exporters of fossil fuels, (Russia, Saudi Arabia, Iran, Iraq, Qatar, Turkmenistan, Venezuela) along with developing countries who are huge producers and consumers of fossil fuels (China, India, Indonesia) to leave 75% of their known deposits fossil fuels in the ground. That means damaging the economic prosperity of their own countries, without compensation or a plan to fully offset the economic and potential political repercussions. What is happening is that the producer and consumer countries outside of the OECD are giving a collective shrug, whilst the climate mitigation policies in place assume that these other countries will somehow fall into line. There is a massive disconnect between consensus belief and global political reality.